When analyzing the abovementioned claims, the first question must always be: whether the government action at issue constitutes an imposition or implementation of a land use regulation. 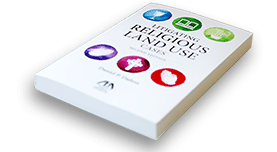 The answer to this threshold question proved fatal to a RLUIPA challenge by House of Prayer Ministries’ (House of Prayer) against the Rush County Board of Zoning Appeals (Board). In that case, Milco Dairy Farms, LLC, sought Rush County’s approval for the construction and operation of a concentrated animal feeding facility. To do so, Milco needed to obtain an exception from Rush County’s zoning ordinances. Milco applied for such an exception. The House of Prayer—a religious summer youth camp which can host up to 768 children per summer—is located only one-half mile from the proposed facility. Asserting that Milco’s proposed facility will produce dangerous wastes, become a nuisance and risk to the religious camps’ attendees, and diminish the House of Prayer’s property value, the House of Prayer objected to Milco’s application. a zoning or landmarking law, or the application of such a law, that limits or restricts a claimant’s use or development of land (including a structure affixed to land), if the claimant has an ownership, leasehold, easement, servitude, or other property interest in the regulated land or a contract or option to acquire such an interest. As the definition explicitly states, RLUIPA’s scope is limited. The limitation, arguably, affects a claimant’s standing. In other words, to argue a RLUIPA violation, the claimant must have some form of interest in the land that is subjected to government action. In the case above, although the House of Prayer owned a neighboring property one-half mile away, it held no interest in the land where Milco’s proposed facility will be constructed. Accordingly, the Court held that any RLUIPA claim brought by House of Prayer must fail. Click hereto view the court’s opinion. This is but one of the many issues that could arise when asserting a RLUIPA claim. If you have any question about this blog, or would like to know how the experts at Dalton & Tomich, PLC, can help, feel free to contact us. See42 U.S.C. §§ 2000cc(a)(1), (b)(1)–(3). 42 U.S.C. § 2000cc-5(5) (emphasis added).